"Those [diseases] which fever cannot cure are to be reckoned wholly incurable." Kaio Therapy’s Immune Activating Heat Therapy (IAHT) combines the promising and rapidly expanding field of immunotherapy with the proven effects of hyperthermia. It allows patients a treatment for primary tumor elimination, tumor control and margin reduction with an immunotherapeutic component. Simply put, Kaio Therapy’s IAHT technology activates the immune system and destroys cancer cells. Specifically, the technology results in an increased number of cancer antigens bound to Heat Shock Proteins (HSP). This mechanism naturally allows more of a person’s unique combination of cancer antigens to be presented to their immune system, resulting in a broad and robust activation that is essential for immunotherapy. The patient treated with IAHT should expect a very specific attack on the treated tumor as well as distant tumors and “dormant” cancer cells. Essentially, IAHT provides a treatment solution that has the potential to positively influence the outcome of all existing threats anywhere in the body that stems from the single treated tumor. Our IAHT system is currently focused on cutaneous tumors (although we anticipate easy migration to other indications such as primary breast tumors and Squamous Cell Carcinoma of the Head and Neck – SCCHN). The therapy is comprised of two components. First, a solution of nanoparticles is injected into the tumor to be treated. This Magnetite Cationic Liposome (MCL) nanoparticle formulation enables the injected material to remain within the treated cancer cells for an extended period of time. The second component is an Alternating Magnetic Field (AMF) device that uses the dynamics of a changing magnetic field to excite the intracellular magnetite nanoparticles to produce a precisely controlled “fever” with the tumor cells. Adjacent normal tissue is largely unaffected. The device emissions are harmless to both the operating technician as well as the patient receiving the therapy, with no appreciable effect on cells not containing MCLs. 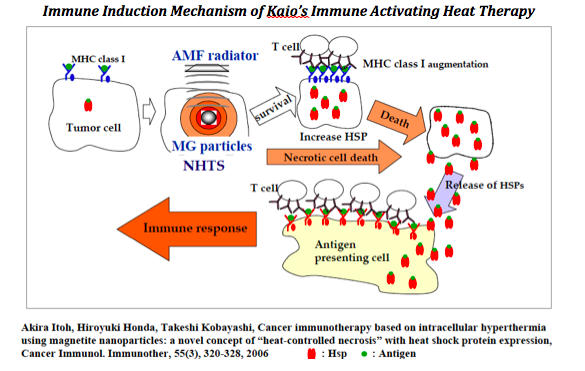 Kaio Therapy's Immune Activation Heat Therapy is a novel hyperthermia system that delivers precisely controlled heat at the cellular level within a tumor. Because Kaio’s IAHT elegantly induces necrosis while activating a systemic, tumor specific response, it can also serve as a platform for other immunotherapies seeking higher efficacies, broader markets and competitive advantage within the cancer market. The depicted experiment graphically depicts the benefit of IAHT as a co-adjuvant therapy. In this particular set of trials, the application of IAHT was sub-optimized in order to showcase the anti-CTLA-4 antibody. The development and growth of cancer represents an immune system failure. As a result, most cancers successfully evade an individual’s immune response. This is what causes devastating disease. While the immune failure arises due to multiple factors, our technology focuses on the lack of proper activation of key immune cells. In order for an effective immune response to clear the body of cancer, certain immune cells must recognize that there is a threat. Cancerous cells produce antigens or small pieces of the tumor that could lead to immune recognition and subsequent tumor destruction. IAHT takes advantage of the normal cellular response to heat stress to provide a cancer therapeutic derived from the patient’s own immune system - a personalized attack on the exact cancer composition affecting the patient. Additionally, as a by-product of this natural immune initiation, a vaccine-like memory response is left to combat possible recurrence of that specific disease. This is very important given a double-digit chance of recurrence of cancer. Kaio Therapy’s IAHT simultaneously educates and activates each individually captured antigen, essentially building an army of cancer killing immune cells. All expressions of the cancer are killed, whether in primary, metastatic or circulating cancer cells. The therapeutic benefit achieved through our Immune Activating Heat Therapy (IAHT) is derived from a low energy interaction between the proprietary Alternating Magnetic Field (AMF) device and minimally invasive patented nanoparticle formulation. The system employs a precisely controlled and targeted electro-magnetic field over the nanoparticle-infused tumor. The net positive charge of the MCL increases an intake efficiency of the magnetite into the negatively charged malignant tumor cells and prevents the leakage of MCLs from the tumor. The intracellular deposition of the magnetite is just part of the advantage we have over traditional attempts at hyperthermia. It allows for the ability to uniformly heat the malignant tumor tissue with fine tuned precision. The resulting hyperthermic immunotherapy is designed to modulate the patient’s own immune response to better recognize and vigorously attack cancerous cells.